We use Cann Mills stoneground organic flour in our breads. We are always seeking to expand our network of outlets. If you would like to discuss stocking our products, at wholesale prices, please contact Paul Merry. 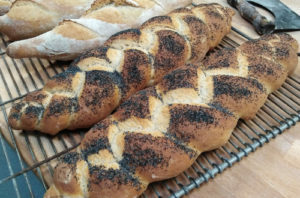 The full range of bread is available from our Collection Points (CP) at Cann, Shaftesbury, and Gillingham, or from our many independent shops and delis. Alternatively, you can opt for our Next Day delivery service – see more below. We use Stoate’s stoneground flour which retains all those nutritious darker bits, germ oil, vitamins, and minerals essential for health. Not white actually, but creamy off-white. Maximum sieving for a stone mill, but unlike industrial white flour, the sieving still leaves lots of nutritious darker bits, and the flour is suffused with the precious wheat germ oil with its natural vitamins and minerals. All white products are made using the sponge and dough method, which gives depth of flavour and long-keeping qualities. PANARY’S yeasted brown bread uses a blend of wholemeal and stoneground white flour from Cann Mills. At Stoates flour mill the ‘Granary’ type is called Malt Star. An ancient grain, genetically thought of as a cousin of wheat, grown in early Middle East civilisations, spread around by the Romans. Unlike wheat it has not been changed and hybridised by mankind in the twentieth century. It has retained its own type of gluten that is considered more digestible than wheat. By the nineteenth century in Britain spelt was superseded by the modern wheat varieties with their higher yields. Very expensive because its tough hull needs to be removed by a polishing process (like rice). Nutty flavoured, the softer gluten needing the support of a tin. Loaves are made with equal weight of wholemeal spelt flour, and sieved (white) spelt. Entirely different bakery practice, with the leavening of the bread done by a nurtured wild yeast, rather than the factory made strain. Its discovery, thousands of years ago, would have occurred by accident as bread makers encountered spontaneous fermentation. Gives an acidic tanginess, different structure, and keeps well. Enjoyed by those wishing to avoid factory made yeast, and those who like robust and moist bread. PANARY’s flagship loaf, a mixture of sieved 81% (brown) and stoneground white, leavened by a wild strain of yeast present in our local Dorset flour. Bottom baked, with a remarkable crust, and a moist chewy crumb. Pure 100% rye (no wheat whatsoever), made with rye sourdough leaven in the style of rye breads made in Russia and the Baltic states where wheat cannot be grown easily. Needs the support of a tin. Keeps for a week. Where can I buy (or collect) bread? Large retail orders delivered by prior arrangement. Place your order using our ‘click and collect‘ store and we will post it to you on Thursday – it’s that simple. Loaves are wrapped, labelled, and placed into a strong box for dispatch. We understand that home delivery may sound a little expensive, but our aim is always to get your bread to you safely and in great condition. That is why we use Parcelforce Express 24 tracked service only. Can’t find what you are looking for, a special event coming up, curious about how I make #RealBread, dietary question? Whatever your question, please contact me and I will try to help.